The Renault Kwid has won the 'Car of the Year' award at the Autocar India Awards 2016 held at Taj Lands End, Mumbai on January 29, 2016. Apart from the top award, the Kwid also drove away with the title of 'Hatchback of the Year'. In the two-wheeler category, the Bajaj Pulsar RS 200 was adjudged the 'Bike of the Year'. The RS 200 not only impressed the eminent jury but also our readers, as it won the 'Readers' Choice Bike of the Year' award as well. The Kwid fought off tough competition from the likes of Maruti Baleno, Honda Jazz and even the Hyundai Creta. In fact, the Creta walked away with three awards as it was pronounced the 'Readers' Choice Car of the Year', the 'SUV/Crossover of The Year' as well as the 'Premium SUV/Crossover of the Year'. The country’s largest carmaker Maruti Suzuki won the 'Manufacturer of the Year' award with its newest hatchback, the Baleno, being adjudged 'Premium Hatchback of the Year' as well as 'Best Value for Money Car of the Year'. The Autocar India Awards are highly prized by both car manufacturers and car buyers. It is the outcome of months of behind-the-scenes work, where the contenders are put through a series of rigorous tests by the most experienced jury members in the field. Apart from the above winners, the BMW i8, Mercedes-Maybach S-class, Audi Q7, Ducati Scrambler Icon and Triumph Tiger 800 XCx were some of the other models that earned a spot in the roll of honour. 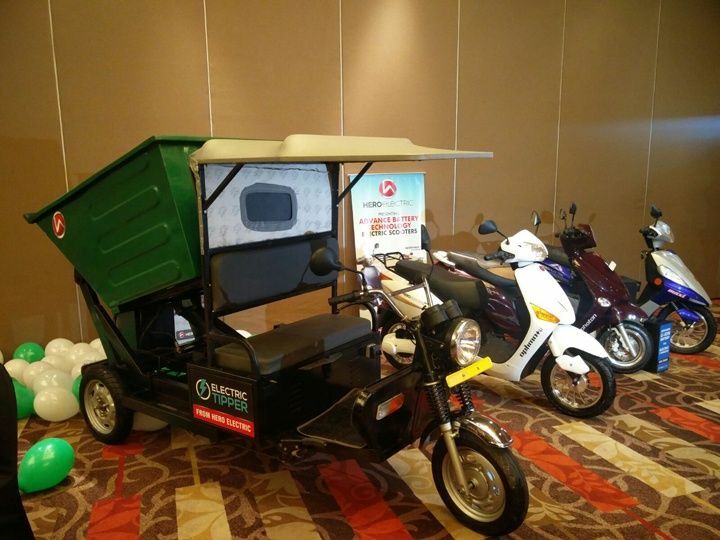 Hero electric unveils its scooters with lithium ion batteries and an electric tipper. Hero Electric today unveiled its new high-speed electric scooter with Lithium-ion batteries compared to the AGM VRLA batteries which did duty on the older bikes. The Photon Li is the high-speed scooter and boasts of a top speed of 45kmph and promises to run for 60km on a single charge. Hero claims that the motor and battery packs have been specifically developed for the Indian weather and road conditions. In addition, the motor boasts of a peak power of 1500W, a multi stage heavy duty charger that regulates the charge depending on the battery condition and an electronic controller for optimum torque delivery. It also boasts of telescopic suspension up front and a disc brake mounted on 10-inch rims. Other features include an anti-theft alarm and dual mode of power and economy. Hero Electric has also introduced a first of its kind Electric Tipper waste management vehicle. The Tipper is priced at Rs 1.45 ;lakh ex-showroom Delhi without the battery, while the Electric Tipper with the battery carries a sticker price of Rs 1.75 lakh ex-showroom Delhi. It promises a range of 80km on a full charge and a top speed of 25kmph. It also comes with a 100AH lithium ion battery which requires 12 hours for a full charge. The Tipper also boasts of a pay load capability of 300kg and a peak power figure of 2000W. Hero Electric has also launched its charging stations to improve the electric vehicle charging infrastructure in India and is in talks with various agencies and state governments to get them installed in various locations. The Baleno RS concept will likely be shown with the new 110bhp 1.0-litre Boosterjet turbo-petrol engine. A sportier version of the Maruti Baleno, dubbed Baleno RS concept, will be displayed at the Auto Expo. The concept is expected to get minor styling tweaks to make it look sportier, and will be powered by a new engine. The concept will likely be equipped with the 1.0-litre 110bhp Boosterjet turbo-petrol motor that made its debut under the hood of the iK-2 concept at the Geneva motor show, early 2015. It was later showcased in the Baleno at the Frankfurt motor show in the same year. The manufacturer is expected to launch the motor in India though no official date has been revealed yet. The manufacturer has already started testing the engine on Indian roads with pictures of test mules seen on the internet. Maruti will also showcase a near-production version of the Ignis hatchback as a precursor to the production-spec model that is likely to be launched later this year. Also to be revealed is the all-new Vitara Brezza compact SUV that will rival the likes of the Ford EcoSport and Mahindra TUV300 and sit below the S-Cross in the carmaker’s line-up. Bajaj has had its new commuter motorcycle on test for a while now, with spy shots giving away details like the cruiser-derived design inspirations. Bajaj has now teased the motorcycle and has revealed the bike's name as the Bajaj 'V'. The official reveal takes place on Feb 1, ahead of the 2016 auto expo. The unusual name has been derived from India's first aircraft carrier - the INS Vikrant. The connection to the battleship isn't limited to the name alone, as Bajaj claims the 'V' has been made out of melted scrap metal taken from the INS Vikrant. The teaser images of the V reveal details like a front disc brake, the long seat, alloy wheels with five dual-spokes, café-racer like front end, telescopic front forks and twin-rear shock absorbers. The motorcycle is believed to be powered by a 150cc, single-cylinder, air-cooled engine mated to a 5-speed gearbox. Bajaj is likely to place the V in between the Discover and Pulsar. Over 65 exhibitors will attend this year’s Auto Expo in Greater Noida from February 5-9, making it the biggest in its history. These are five important cars that will be on display, showcasing the future of the Indian car market. Ford is looking to improve its sales in India, and while the Mustang won’t shift in big numbers it will help raise the manufacturer’s profile in the country. The American icon is coming to India in right-hand drive for the first time and will be a big draw for snap-happy punters at the Auto Expo. While other international markets can opt for a 2.3-litre Ecoboost-engined Mustang, India is expected to only get the full-blown 437bhp 5.0-litre V8 with a six-speed automatic gearbox. The sixth-generation US-bred performance car gets a change in suspension to improve its ride, as well as a bigger cabin than the model it replaces, with a big boost in interior quality. There’s lots of excitement over Honda’s bike line-up at the Auto Expo, and its cars deserve a look as well. The manufacturer isn’t bringing the HR-V to India, but it’s instead looking to capitalise on the rapidly growing small SUV segment by launching the Brio-based BR-V. It will be against rivals like the Renault Duster and Hyundai Creta, but the Honda BR-V has one-up on them in terms of practicality thanks to a third row of seats that will mean it can accommodate up to seven passengers. Production will take place at Honda’s Tapukara factory in Rajasthan. Following successful launches of the Baleno and S-Cross last year, Maruti Suzuki will kick-off 2016 with the Vitara Brezza compact SUV. Borrowing from the styling of the Vitara, which is sold overseas, the smaller Vitara Brezza has been conceived, designed and developed entirely by a team of in-house Maruti engineers. Thought to be powered by Maruti’s current crop of engines, which could include the 1.2- and 1.4-litre petrol and 1.3-litre diesel engines motors, an AMT-equipped model could eventually join the range. Hyundai is also rumoured to be plotting a compact SUV that could steal the limelight from the Vitara Brezza at the Auto Expo. The German manufacturer was the best-selling luxury brand in the country last year, and it will look to cement its place at the top of the sales charts in 2016. First up for this year is the launch the of GLC-Class crossover to rival premium offerings from BMW and Audi. It’s available in two variants of the 2.1-litre diesel engine mated to the new nine-speed automatic gearbox and it gets a new name to go in line with Mercedes’ new SUV nomenclature. The GLC-Class is closely aligned to the C-Class sedan in terms of styling and interior features, but gets an increased ride height, longer wheelbase, and more space inside. The compact sedan has been made specifically for the Indian market and will be built at VW’s Pune plant in the first half of this year. VW has invested Rs 720 crore towards the development of the Ameo as part of its long-term investment in India and it’s thought the sedan will come packed with features, commanding a higher price than rivals like the Honda Amaze.